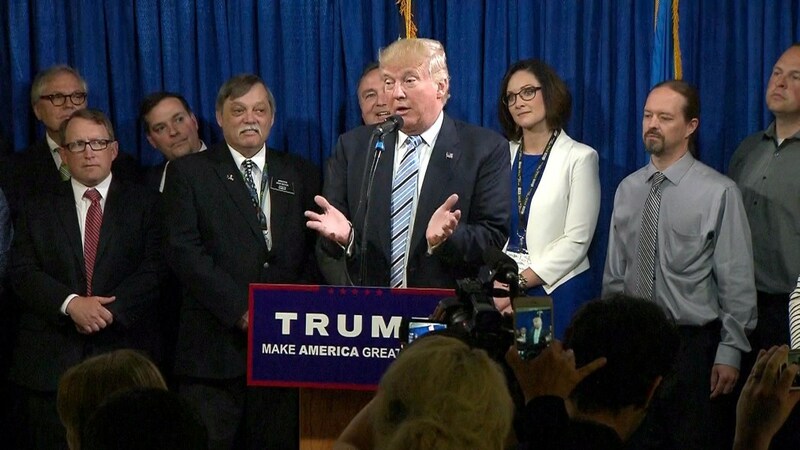 In a rare prepared speech, Donald Trump outlined his energy policy in Bismarck, North Dakota. Trump is known for bucking conservative orthodoxy but, on Thursday, the presumptive Republican presidential nominee largely hewed to the typical Republican line. Reading from a teleprompter, Trump called for reducing restrictions on energy exploration, opening up more federal lands to drilling, and reducing dependence on foreign oil. He said he would try to reopen negotiations to build the Keystone XL pipeline, which President Obama rejected. He railed against “draconian climate rules” and said he would “cancel” the Paris climate agreement and withdraw any funding for United Nations programs related to global warming. Trump has repeatedly called climate change a “hoax” in the past, bucking the overwhelming international scientific consensus that man-made emissions are spurring a dangerous increase in global temperature. Trump was joined by North Dakota Congressman Kevin Cramer, an early supporter now serving as an adviser to the candidate on energy policy. Beyond vague promises to create jobs in whatever resource is most prevalent in a given state, Trump’s energy platform has been relatively unknown until now. The most politically charged case was in Iowa, where he championed renewable fuel requirements that spurred local ethanol production while arguing that rival Sen. Ted Cruz opposed them because he was reliant on oil industry donations. Trump told reporters on Thursday would meet with the governor of Iowa before making any changes to ethanol policy. Adopting a rally cry of conservative ethanol opponents, though, he remarked in his speech that “the government should not pick winners and losers” in energy. He did not directly address the issue in his remarks. In recent days, Trump has pledged to reopen mines in states like Pennsylvania, Ohio, Indiana, and West Virginia — something experts say is unlikely given that the industry is in a long decline thanks to competition from cheaper alternatives like natural gas. “We’re going to save that coal industry, believe me, we’re going to save it,” Trump said on Thursday. Asked before his speech whether he was over-promising based on these obstacles, Trump said “market forces are beautiful,” and he wouldn’t interfere with competition. But he predicted he would be able to restore coal jobs by removing environmental regulations. Trump’s contempt for regulations did not seem to extend to renewable energy, though, where he complained that wind turbines were “killing all of the eagles” and predicted the industry would fail without subsidies. Despite this, he said he was “into all kinds of energy” and added in his speech that nuclear, solar, and wind power would play a role in the future. In a statement, the League of Conservation voters criticized Trump’s new policy outline for failing to protect the environment.